L 6 1/4″ (16 cm). A variety of “chirp” and “cheep” notes monotonously repeated. 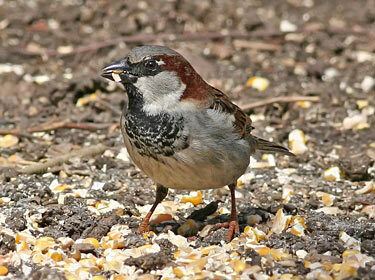 Description: Breeding male has gray crown; chestnut nape; black bib and bill. 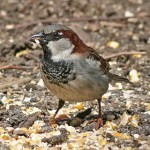 Brown upperparts; white cheek patch; one white wing bar; and unstreaked brownish-gray underparts. Male fall plumage is edged with gray, making the bird look duller overall. Female is very plain; mottled brown upperparts; buffy eye stripe; and grayish-brown unstreaked underparts. Juveniles are similar to female. Habitat: Always associated with humans. Found in cities, suburbs, and around farm buildings. Nests in almost any kind of cavity or crevice. Where in Nebraska: Abundant introduced permanent resident across the state. Field Notes: These sparrows can adapt to their local environment amazingly fast, and can vary their body size and plumage to suit their surroundings. Fun Facts: House Sparrows take frequent dust baths by throwing dust into the air around their body feathers, much like taking a bath in water. In taking dust baths they may form a small depression in the ground and defend it from other birds.